Suunto Fused™ RGBM algorithm is locked for 48 hours if you omit decompression stops for longer than three (3) minutes. When the algorithm is locked, no algorithm information is available and LOCKED is shown instead. Locking the algorithm is a safety feature, highlighting that the algorithm information is no longer valid. 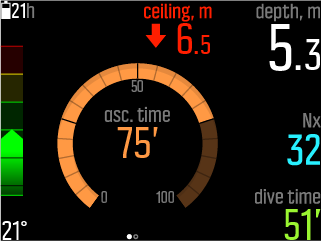 When you ascend above the decompression ceiling by more than 0.6 m (2 ft), the ceiling parameter turns red with an arrow pointing down appears, and an audio alarm is generated. In such a condition, you should descend back below the ceiling level to continue the decompression. If you fail to do so within three (3) minutes, Suunto EON Steel locks the algorithm calculation and displays LOCKED instead, as shown below. Note that the ceiling value is no longer present. In this state, you significantly increase your risk of decompression sickness (DCS). Decompression information is not available for the next 48 hours after surfacing. 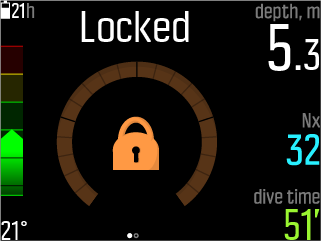 It is possible to dive with the device when the algorithm is locked, but instead of the decompression information, LOCKED is shown. Diving while the algorithm is locked resets the algorithm lock time back to 48 hours when you surface.